An article published in “The Astrophysical Journal” describes the observations of the birthplaces of most of today’s stars. A team of astronomers led by Wiphu Rujopakam of the University of Tokyo and the Chulalongkorn University in Bangkok used the VLA and ALMA radio telescopes to study galaxies so far away that we see them as they were about 10 billion years ago, when in the universe there was a peak period of star formation. Astronomers already knew that at that time galaxies were very prolific, the problem was to be able to study them. To see so far back in time you have to find galaxies distant between 9 and 11 billion light years but also be able to examine what they look like inside. However, at that time they were young and composed of huge amounts of dust which shielded the light at visible frequencies. Instead, radio waves pass through the dust so they can be detected with radio telescopes, using them to their full sensitivity. A few months ago a number of articles were published about the use in particular of the ALMA radio telescope, inaugurated in March 2013, to explore the so-called Hubble Deep Field and even the Ultra Deep Field, where very distant galaxies were found. In this new research, the astronomers combined the possibility of ALMA (Atacama Large Millimeter/submillimeter Array), in the desert of Chile, with those of the VLA (Very Large Array) radio telescope, in New Mexico, to be able to detect star formation at inside those galaxies that are so far away. The observations were the most sensitive ever made with the VLA, needed to detect signals coming from so far away. Preshanth Jagannathan of NRAO (National Radio Astronomy Observatory), one of the authors of the study, compared the intensity of those signals to those of a mobile phone that called from a distance twice that of Pluto. Despite the difficulties, the researchers collected interesting information that allowed them to better understand the mechanisms that in that remote era led to such a prolific period as to result in the birth of most of the stars existing in the universe today. 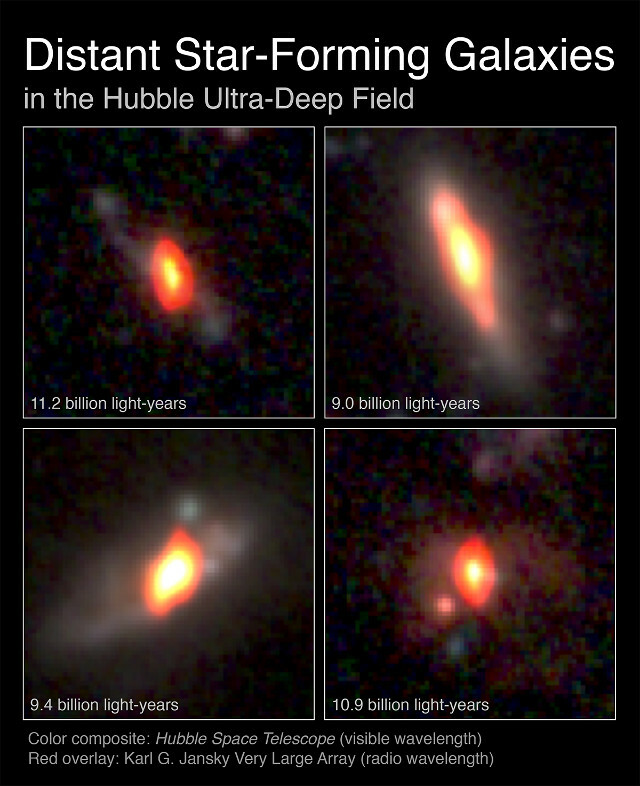 They found that the remarkable star formation in the galaxies observed occurred throughout thems while in the young galaxies in which star formation levels are similar this phenomenon occurs in much smaller regions. In particular, the VLA was the instrument that showed where the star formation was taking place while ALMA revealed the presence of cold gas which is the fuel for star formation. The combination of these two radio telescopes allowed to take a step forward in understanding how starbirth has changed over time.